What Is A Baby Boomer? A baby boomer is a person who belongs to a unique post Second World War generation. Here is some more information about the generation of baby boomers, who are now in their old age. A baby boomer is a person who was born during the post Second World War years, an age marked by an unusually high number of births and a rise in economic prosperity. An estimated 79 million babies are believed to be baby boomers. In the United States, the term "baby boomer" also refers to people whose date of birth comes prior to the Vietnam war and after the Second World War. Therefore, baby boomers in America might belong to one or more generations. "Baby boom" is a special term that embraces not just the population, but also the American culture. Baby boomers are classified in a number of ways. Steve Gallion, author of Boomer Nation, puts baby boomers into two categories: those born between 1945-1957 and "Shadow Boomers" born between 1958-1963. Many people don't consider "Shadow Boomers" as an apt term to be used with reference to baby boomers. Instead, they prefer the term "Echo Boomers." William Strauss and Neil Howe, authors of Generations, opine that those born between 1961 and 1964 impact political as well as cultural patterns, just like those born between 1955 and 1960. The writers also mention a "thirteenth generation," called "Generation X" or the "generation of Cold War" referring to people born between 1961 and 1981. Some are of the opinion that the generation of baby boomers originated during the Vietnam war. At the same time, many people believe that musical groups such as the Beatles, Hippies, and the Motown Sounds are characteristic of the age of the baby boomers. The Great Depression and the Second World War created great fear and uncertainty. A number of unmarried people were forced to put off their marriages. On the other hand, married couples had to delay giving birth to a baby. After the Second World War, the economy of the country improved. The period between 1950 and 1960, marked as it was by economic prosperity, was the right time for the birth of a number of babies, which led to a "Baby Boom." Baby boom is also simultaneous with a boom in the construction of buildings such as houses, schools, and shopping malls. The rise in population and the growth of families prompted mass migration of people from cities to suburbs during the years that following the Second World War. National culture also received an outlet as reflected in the appearances of baby boomers when they entered into their youth. The culture of the nation was defined by the way they dressed, wore their hair, their political ideology, and even the type of music they preferred. As the baby boomers grew older, their purchasing power grew, and a variety of companies could make large profits. When they reached the age of retirement, the resources of the public were almost depleted. We have an interesting assortment of highly educated, spoiled, lazy, immoral, hippie, and many more types of baby boomers. All of them are now aged fifty or above and can be considered as senior citizens. According to the ABC News report of January 10, baby boomers have succeeded in redefining the term "aging." Compared to the generation that preceded them, baby boomers are better educated and healthy and have a unique passion for life. They are expected to live to a ripe old age of 80 or even beyond it. Undoubtedly, the age of the baby boomers, that began with a raised birth rate and a heightened economy during the post Second World War period, is remarkable. Thanks Nat for your contribution on baby boomers. You can build another page by going to our Mini Sites Form page. We will link all of your submission together for easy navigation on your own mini site. You can also load photos and images directly to your page. If you want me to add some photos for you, just reach me at our Contact Us page. 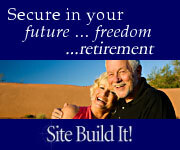 If you are not Nat, ---- then write your own mini site page right here within Enjoy Retirement Jobs.com by starting at our Mini Sites Form page. Boomers are not the ones causing problems. We are the ones that solved many, many problems. Go Boomers. Join in and write your own page! It's easy to do. How? Simply click here to return to Your Own Mini Site.